Formerly known as Kiss Me, blinc is the original mascara invented to form tiny water-resistant "tubes" around your lashes rather than painting them like conventional mascaras. Once applied, these beauty tubes bind to your lashes and cannot run, smudge, clump, or flake, even if you cry or rub your eyes. Whether your daily activities take you from the office, to your sweaty workout and then out to dinner, your lashes will look as good in the evening as they did when you first applied blinc in the morning. I love, love this mascara. I really detest mascara that flakes so you get black specks on your face and in your eyes. This mascara stays put, does not smear. I had to adjust how I apply mascara as it dries pretty quick, but it looks fantastic. And the colors are so much fun! I have all of them. Wish they had grey though. I LOVE BLINC MASCARA! Not only does it do away with the black smudges under the eye, it lengthens the eyelashes like no other. It stays on when out in the Texas heat watching sports and that says something about how good the product really is. I have women ask me quite often what kind of mascara I use. It has to look good for someone to ask. The dark brown is just slightly lighter than the black, so I use it when I'm outside, saving the black for work and evenings. WONDERFUL PRODUCT! This is the only mascara that I can wear. My eyes tear so others always end up as circles around my eyes. I love it. I have extremely sensitive skin and this is the only mascara I can use. It's amazing. Love this mascara, I think my lashes are finally growing... and it does not come off until I take it off!!!! good waterproof...different than anything else. like it! Love this mascara. It stands up to hard work behind sunglasses. Application: You apply blinc like a regular mascara. It is important that you do not use conditioners, lotions, etc... before applying the mascara. 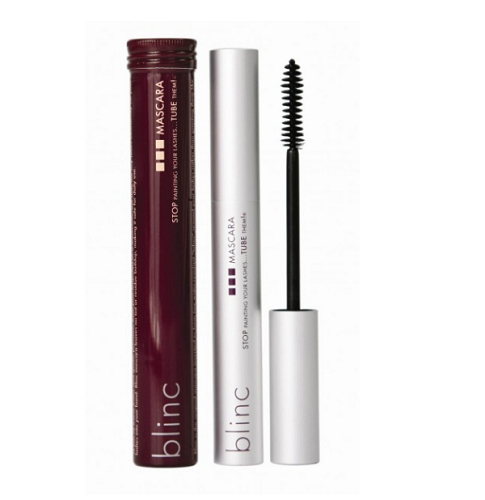 blinc requires a dry, clean surface in order to adhere properly to your lashes. 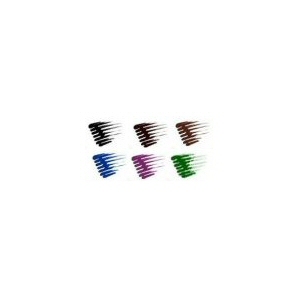 It takes blinc about 2 minutes to set and begin forming the tiny "tubes" around your lashes. Do not let it set before applying another coat in order to build...keep adding coats until you are satisfied with the volume, length and degree of lash separation before blinc mascara sets. Once it sets, you can no longer build. Removal: Only when you are ready, blinc can easily be removed with a combination of warm water and gentle pressure. Pressure alone is not enough, and water alone is not enough. It must be a combination of lots of warm water and gentle pressure - for example taking a shower, will make the tiny tubes effortlessly slide off your lashes. You will actually see the tiny beauty tubes in your hand. Nothing oily can make blinc come off...not even if you have really oily skin. Water, Ammonium Acrylates Copolymer, Butylene Glycol, Tromethamine, Acrylates Copolymer, Sodium Dehydroacetate, Phenoxyethanol, Ethylparaben, Pentasodium Triphosphate, [May Contain: Ultramarines (Cl77007), Iron Oxides (Cl 77492, Cl 77491, Cl 77499), Chromium Oxide Greens (Cl 77288)].